Acinetobacter baumannii is a Gram-negative, obligate aerobic coccus mostly causing infections in healthcare settings and found mostly in soil, water, and sewage . Bacteremia caused by A. baumannii is a common nosocomial infection in critically ill patients. Acinetobacter spp. consists of non-fermenting, coccobacilli and they are opportunistic pathogens . Initially, A. baumannii infections were at low potential but now a days it is responsible for several types of hospital acquired infections and regarded as one of the most troublesome pathogens [3,4]. Unique feature of this organism is the ability to utilize different carbon sources and its ability to survive in a range of temperatures and pH conditions. La Scola and Raoult  studied and found that this microbe may utilize the arthropod source for mean of transmission, which they isolated from human body lice. Mortality rates of patients suffering A. baumannii infections can be as high as 75% . Currently, no alternative treatment approaches are available for multidrug resistance microorganism, but biofield treatment may be a new approach to cope up with this global problem. Biofield is the name given to the electromagnetic field that permeates and surrounds living organisms. It is the scientifically preferred term for the biologically produced electromagnetic and subtle energy field that provides regulatory and communication functions within the organism. However, the energy can exists in several forms such as kinetic, potential, electrical, magnetic, and nuclear. Similarly, the human nervous system consists of the energy and chemical information in the form of electrical signals. Thus, human has the ability to harness the energy from environment or universe and can transmit into any leaving or nonliving object(s) around the globe. The objects always receive the energy and responding into useful way that is called biofield energy and the process is known as biofield treatment. In spite of countless study reports of the effectiveness of biofield therapies , there are very few well controlled and peer-reviewed experimental studies . According to law of mass-energy inter-conversion , the conversion of mass into energy is well stabilized, but its inversion i.e. energy into mass has not yet proved scientifically. Whenever these electrical signals fluctuate with time, the magnetic field generates as per the Ampere-Maxwell law, and cumulatively known as electromagnetic field. As responses by humans can be accounted for by the placebo effect, these experiments on lower organisms were designed in order to directly test the impact of biofield energy through scientific studies to rule out the placebo effect. It is widely accepted that lyophilization is the method most commonly used to store and transport microbial cultures, as change in the biochemical and enzymatic characteristics of an organism cannot be carried out in this state. Mr. Trivedi’s biofield treatment (The Trivedi effect®) is well-known to change the various physicochemical characteristics of various materials after his biofield treatment. In addition, Mr. Trivedi biofield has considerably altered the antimicrobials susceptibility and biochemical reactions of microbes against tested antimicrobials [10-12]. It has also significantly altered the crystalline and powder characteristics of metals [13-20]. In agriculture, biofield treated crops has been reported for a significant change on growth, characteristics and yield of plants [21-25]. There are scanty reports on investigating biofield treatment against microbes. Present study reports the impact of biofield on A. baumannii, for its antimicrobials susceptibility pattern along with biochemical properties of revived and lyophilized cells of A. baumannii as compared to its control groups. A. baumannii strains were procured from MicroBioLogics, Inc., USA, in two sets A and B. Two different sealed packs were stored with proper storage conditions until further use. Following parameters like antimicrobial susceptibility, biochemical reactions and biotype number were estimated with help of automation on the Microscan Walkaway system (Dade Behring Siemens) using NBPC30 panel with respect to control groups. Finally, all the groups (i.e. control and treated) were investigated for its antimicrobial susceptibility, biochemical reactions pattern and biotyping. All antimicrobials and biochemicals were procured from Sigma Aldrich, USA. Two ATCC (American Type Culture Collection) samples (ATCC A and B) of A. baumannii were grouped and subject to biofield treatment. ATCC A sample was revived and divided into two parts Gr.I (control) and Gr.II (revived); likewise, ATCC B was labeled as Gr.III (lyophilized). Then group II and III were treated with Mr. Trivedi’s biofield energy. The treatment groups were in sealed pack and handed over to Mr. Trivedi for biofield treatment under laboratory condition. Mr. Trivedi provided the treatment through his energy transmission process to the treated groups without touching the samples. Gr.II was assessed on the 5th and 10th days after treatment while Gr. III was assessed on 10th day. Finally, all the groups (control and treated) were investigated for antimicrobial susceptibility, biochemical reactions pattern and biotyping compared with control. Antimicrobial susceptibility pattern of A. baumannii was studied using MicroScan Walk-Away® NBPC30 as per manufacturer's instructions. The qualitative antimicrobial susceptibility pattern (S: Susceptible, I: Intermediate, NR: Not Reported, and R: Resistant) and minimum inhibitory concentration (MIC) were determined by observing the change in antimicrobial concentration as per the latest CLSI guidelines . The biochemical reactions and biotype number of A. baumannii were also determined by MicroScan Walk-Away® system. Effect of biofield treatment on A. baumannii to the vital processes occurring in living organisms were studied . Table 1: Antimicrobial susceptibility assay of control and biofield treated A. baumannii. 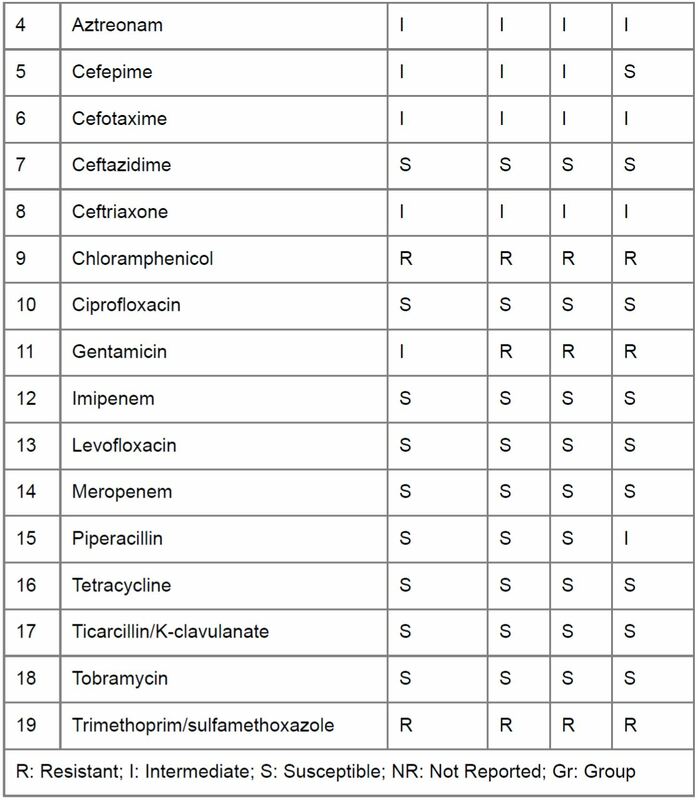 The data pertaining to the antimicrobials susceptibility tests and details of MIC values of biofield effect were observed, analyzed and reported in Tables 1 and 2. The effect of biofield treatment showed that the cefepime, converted from I → S in lyophilized treated group, gentamicin converted from I → R in all the treated group and piperacillin converted from S → I only in lyophilized biofield treatment group as compared to control. Quantitative assessment, MIC results showed that amoxicillin/K-clavulante, β-lactamase-inhibiting antimicrobial have showed a decrease in values i.e. from 16/8 to less than 8/4 µg/mL in both the treated groups as compared with control. Gentamicin value increased in all the groups after biofield treatment as compared to control. Nitrofurantoin showed increased MIC value in Gr. II, while norfloxacin showed increased MIC in Gr. II as compared to control. Rest antimicrobials did not show any change in susceptibility pattern and MIC value after biofield treatment compared to control. Table 2: Minimum inhibitory concentration (MIC) of A. baumannii for tested antimicrobials. Biochemical reactions denoted with codes were tabulated and showed positive reaction in case of nitrofurantion on day 5 and 10 i.e. from negative (-) to positive (+) in revived treated group (Gr II) with respect to control (Table 3). Table 3: Effect of biofield treatment on biochemical reactions of A. baumannii. Biochemical tests results revealed a change in biotype number in Gr.II at day 5 and 10 of A. baumannii after biofield treatment with respect to control (Table 4). Table 4: Effect of biofield treatment on A. baumannii to distinguishing feature of the genotype. Biofield treatment is effective and has been experimentally demonstrated change in susceptibility pattern, biochemical reaction and biotype number in experimental setup designed above. Results were unexpected and unprecedented based on the literature so far. These results assumed the presence of energy in biofield with which microbe reacts, which led to alteration of phenotypic characteristics of the microorganism. Due to the high frequency of antimicrobial multidrug resistance among clinical isolates of A. baumannii, it causes serious problems in the choice of appropriate antimicrobials in the past 15 years . This experiment showed that, biofield treatment induces changes in susceptibility pattern of cefepime, gentamicin and piperacillin antimicrobials. However, most frequent mechanism of resistance expressed by Gram-negative organisms against cefepime is the production of β-lactamases that are able to hydrolyze the drugs . Cefepime resistance mechanism is demonstrated in A. baumannii by a combination of hyperproduction of the chromosomal OXA-51/69-like carbapenemases, activation of efflux pumps (i.e. AdeABC) and probably porin changes . The expression of OXA-type carbapenemases in the absence of the other mechanisms of resistance does not result in high-level cefepime resistance. Similarly, expression of chromosomal Acinetobacter-derived cephalosporinase by A. baumannii does not seem to confer resistance. By contrast, production of certain acquired class D OXA-type carbapenemases and/or metallo-β-lactamases are important mechanisms of resistance against cefepime [30,31]. Change in susceptibility pattern in cefepime might be due to the influence of biofield treatment, which may inhibits the production of beta-lactamases enzymes (carbapenemases like) or inactivation of efflux pumps. Quantitative aspect showed lowering in MIC values and change in biotype number which was an accurate approach for epidemiologic investigation of A. baumannii as compared with untreated group. Biotype number of particular organism was arrived at after interpreting the results of the biochemical reactions which led to the particular organism identification. Biotyping makes use of the pattern of metabolic activities expressed by an isolate, colonial morphology and environmental tolerances. In this experiment, biotyping was performed using automated system and found a significant change in the biofield treated Gr. II on day 5 and 10. Among the β-lactamase antimicrobials and inhibitors, amoxicillin/clavulanic acid have shown good efficacy in treating A. baumannii infections  and their decreases MIC values may represent an alternative treatment option for severe nosocomial infections caused due to A. baumannii. The biochemical tests like oxidases, nitrate, indole negative and catalase positive are the basic biochemical characteristics of A. baumannii confirmed in this experiment, as Acinetobacter spp. and members of the Moraxellaceae family . In addition, it should be noted that different bacterial strains differ in their characteristics, and it is possible that some microbes are more susceptible/resistant towards biofield treatment than others. The present research data suggest that biofield treatment changed the susceptibility of antimicrobials against microbe, in a continuation of already published reports [10-25]. As a result, the microbe that was intermediate responsiveness changed to either resistant or susceptible to a particular drug after biofield treatment. Present study concludes the impact of biofield treatment on changes in susceptibility pattern of A. baumannii which was confirmed by standard procedures with respect to MIC value, biochemical study and biotype number. Biofield treatment could be applied to alter the sensitivity of antimicrobials to fight against infections microbes due to the emergence of multi drug-resistant strains. Authors gratefully acknowledged the support of Trivedi science, Trivedi testimonials and Trivedi master wellness. 1. Baumann P, Doudoroff M, Stanier RY (1968) Study of the Moraxella group. I. Genus Moraxella and the Neisseria catarrhalis group. J Bacteriol 95: 58-73. 2. Peleg AY, Seifert H, Paterson DL (2008) Acinetobacter baumannii: emergence of a successful pathogen. Clin Microbiol Rev 21: 538-582. 3. Vila J, Pachón J (2012) Therapeutic options for Acinetobacter baumannii infections: an update. Expert Opin Pharmacother 13: 2319-2336. 4. Abbott GM, Cerqueira S, Bhuiyan AY (2013) Carbapenem resistance in Acinetobacter baumannii: laboratory challenges, mechanistic insights and therapeutic strategies. Expert Rev Anti Infect Ther 11: 395-409. 5. La Scola B1, Raoult D (2004) Acinetobacter baumannii in human body louse. Emerg Infect Dis 10: 1671-1673. 6. Chastre J, Trouillet JL (2000) Problem pathogens (Pseudomonas aeruginosa and Acinetobacter). Semin Respir Infect 15: 287-298. 7. Benor DJ (2002) Energy medicine for the internist. Med Clin North Am 86: 105-125. 8. Jonas WB, Crawford CC (2003) Science and spiritual healing: a critical review of spiritual healing, "energy" medicine, and intentionality. Altern Ther Health Med 9: 56-61. 9. Einstein A (1905) Does the inertia of a body depend upon its energy-content. Ann Phys 18: 639-641. 10. Trivedi MK, Patil S (2008) Impact of an External energy on Staphylococcus epidermis [ATCC-13518] in relation to antimicrobials susceptibility and biochemical reactions-an experimental study. J Accord Integr Med 4: 230-235. 11. Trivedi MK, Patil S (2008) Impact of an external energy on Yersinia enterocolitica [ATCC-23715] in relation to antimicrobials susceptibility and biochemical reactions: an experimental study. Internet J Alternat Med 6: 13. 12. Trivedi MK, Bhardwaj Y, Patil S, Shettigar H, Bulbule A (2009) Impact of an external energy on Enterococcus faecalis [ATCC-51299] in relation to antimicrobials susceptibility and biochemical reactions-an experimental study. J Accord Integr Med 5: 119-130. 13. Trivedi MK, Tallapragada RR (2008) A transcendental to changing metal powder characteristics. Metal Powder Rep 63: 22-28, 31. 14. Dabhade VV, Tallapragada RR, Trivedi MK (2009) Effect of external energy on atomic, crystalline and powder characteristics of antimony and bismuth powders. Bull Mat Sci 32: 471-479. 15. Trivedi MK, Tallapragada RR (2009) Effect of superconsciousness external energy on atomic, crystalline and powder characteristics of carbon allotrope powders. Mat Res Innov 13: 473-480. 16. Trivedi MK, Patil S, Tallapragada RM (2012) Thought Intervention through biofield changing metal powder characteristics experiments on powder characterisation at a PM Plant, Springer Berlin Heidelberg, Editor: Wei Deng, Lecture Notes in Electrical Engineering, Future Control and Automation 173: 247-252. 17. Trivedi MK, Patil S, Tallapragada RM (2013) Effect of Biofield treatment on the physical and thermal characteristics of vanadium pentoxide powders. J Material Sci Eng S11: 001. 18. Trivedi MK, Patil S, Tallapragada RM (2013) Effect of biofield treatment on the physical and thermal characteristics of Silicon, Tin and Lead powders. J Material Sci Eng 2: 125. 19. Trivedi MK, Patil S, Tallapragada RM (2014) Atomic, crystalline and powder characteristics of treated zirconia and silica powders. J Material Sci Eng 3: 144. 20. Trivedi MK, Patil S, Tallapragada RMR (2015) Effect of biofield treatment on the Physical and Thermal Characteristics of Aluminium Powders. Ind Eng Manage 4:151. 21. Shinde V, Sances F, Patil S, Spence A (2012) Impact of biofield treatment on growth and yield of lettuce and tomato. Aust J Basic and Appl Sci 6: 100-105. 24. Patil SA, Nayak GB, Barve SS, Tembe RP, Khan RR (2012) Impact of biofield treatment on growth and anatomical characteristics of Pogostemon cablin (Benth.). Biotechnology 11:154-162. 25. Nayak G, Altekar N (2015) Effect of biofield treatment on plant growth and adaptation. J Environ Health Sci 1: 1-9. 26. Fader RC, Weaver E, Fossett R, Toyras M, Vanderlaan J, et al. (2013) Multilaboratory study of the biomic automated well-reading instrument versus MicroScan WalkAway for reading MicroScan antimicrobial susceptibility and identification panels. J Clin Microbiol 51: 1548-1554. 27. Gomaa FM, Tawakol WM, Abo El-Azm FI (2014) Phenotypic and genotypic detection of some antimicrobial resistance mechanisms among multidrug-resistant Acinetobacter baumannii isolated from immunocompromised patients in Egypt. Egypt J Med Microbiol 23: 99-111. 28. Paterson DL, Bonomo RA (2005) Extended-spectrum beta-lactamases: a clinical update. Clin Microbiol Rev 18: 657-686. 29. Bratu S, Landman D, Martin DA, Georgescu C, Quale J (2008) Correlation of antimicrobial resistance with beta-lactamases, the OmpA-like porin, and efflux pumps in clinical isolates of Acinetobacter baumannii endemic to New York City. Antimicrob Agents Chemother 52: 2999-3005. 30. Perez F, Hujer AM, Hujer KM, Decker BK, Rather PN, et al. (2007) Global challenge of multidrug-resistant Acinetobacter baumannii. Antimicrob Agents Chemother 51: 3471-3484. 31. Walther-Rasmussen J, Høiby N (2006) OXA-type carbapenemases. J Antimicrob Chemother 57: 373-383. 32. Higgins PG, Wisplinghoff H, Stefanik D, Seifert H (2004) In vitro activities of the ß-lactamase inhibitors clavulanic acid, sulbactam, and tazobactam alone or in combination with ß-lactams against epidemiologically characterized multidrug-resistant Acinetobacter baumannii strains. Antimicrob Agents Chemother 48: 1586-1592.